Hello all of my friends out there in blogland. It's been almost a month since I've posted and I haven't been commenting on other blogs either. The reason? That ridiculous myleogram I had. I ended up with a leak in my spinal cord which caused a spinal headache. If you have never had one of those, I am SO happy for you. As long as I lay flat on my back, the headache went away. If I lifted my head at all, even 6 inches or so, it came back. And it's not a normal headache. It's awful. I spent a day in the ER while they did all the prep work to do a spinal patch, but it ended up that I asked them NOT to do it. I didn't want another hole poked in my spine when the first one wasn't healing. I was told it would eventually repair on it's own and I just had to stay down until that happened. So, for 2 1/2 weeks I laid flat before it began to go away. That is gone now, but I'm weak from laying around doing nothing for so long. Our son Jamie and grandkids, Kyleigh and Caleb came for Thanksgiving along with a friend and her little family. The kids were all about the same age and had a great time playing together. Everyone helped tremendously with dinner and cleanup and I did very little. They made me sit in the recliner and give orders. 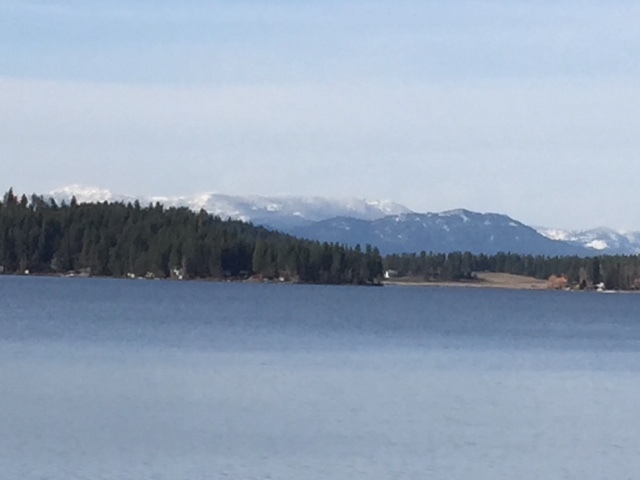 Saturday, Dennis and I took a drive up to the lake and that was really nice. Just to get out but it wore me out completely. Yesterday my handsome husband preached the sermon at church and so I went for the first time in a month. I have NEVER, EVER missed 3 weeks of church in a row in my entire life. Even when I was born I was at church when I was 4 days old! I'm still wobbly and dizzy and know all of the issues aren't fixed but at least that horrible headache is gone. Would you believe after all of that, the tests came back inconclusive? That's it though. They aren't poking on me again. I'll just deal with the back pain. I thought I owed you all an explanation as to where I've been. I wasn't able to write on my phone or Ipad to comment. I couldn't read books or knit or crochet. You talk about a boring few weeks! But now lets move on to the fun stuff. We had a new little preemie baby born at church just before I was laid up. 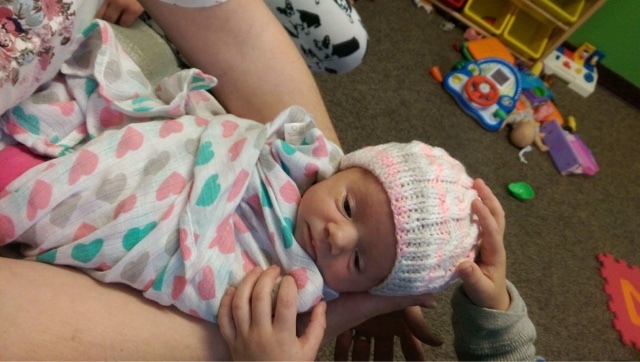 I had knit her a newborn hat, sweater and blanket but she needed an extra small hat, so I whipped one up Saturday night and she wore it the next morning in the church nursery. Meet little Rachel Grace. Isn't she precious? Those are her big brother Trevor's hands patting her. He's in love with his sister. We chose two boys from a children's ranch in Montana to grant Christmas wishes for. They asked for such simple things. Cheetos, socks, silly putty, soap, etc. 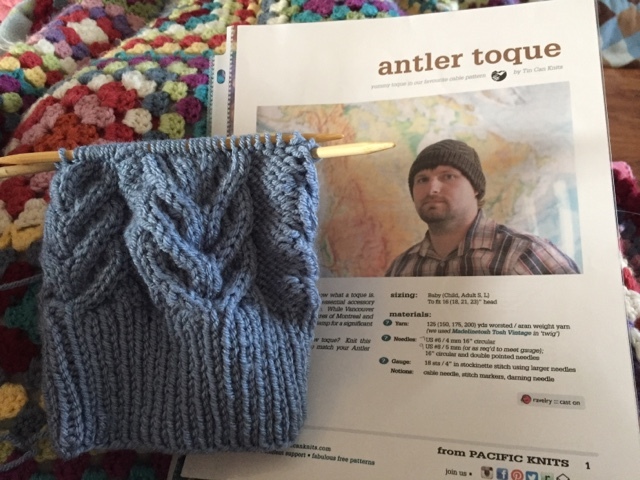 I decided that since it's a working ranch they could definitely use a hat too, so we included an antler toque, (hat). Here they are finished. The top photo is more representative of the true color. Yesterday we found out they still had several children who hadn't been chosen so we took another teenage boy. I'm starting another hat today for him. They're delivering the gifts this weekend so I need to get it done. He asked for bookmarks, skittles, guitar picks, body wash and shampoo. When I compare that to things I hear a lot of kids asking for these days, their wishes are so small. Dennis and I have tried very hard to get every single thing these boys have asked for and then a few extras too. 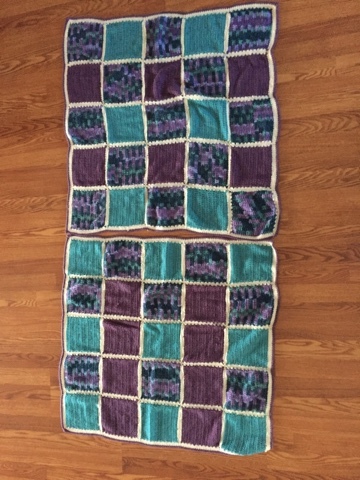 Two more blankets put together for the Crisis Nursery. 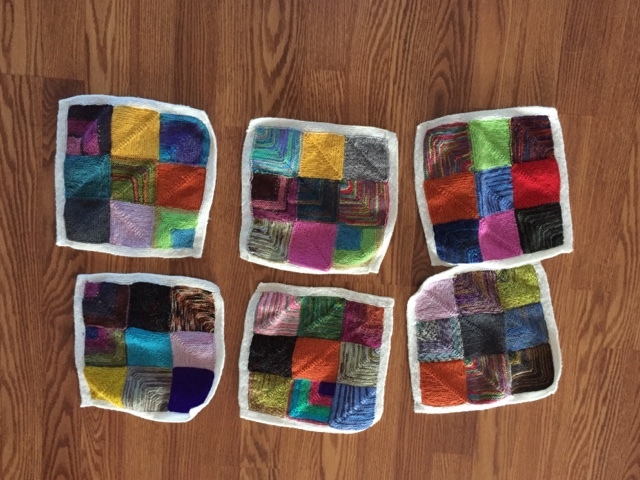 I have six squares made for my Sock Yarn blanket. Two more are done but need the borders. They are time consuming but don't take any thought and are easy to take with me. I have received some very nice surprises in the mail since my last post. 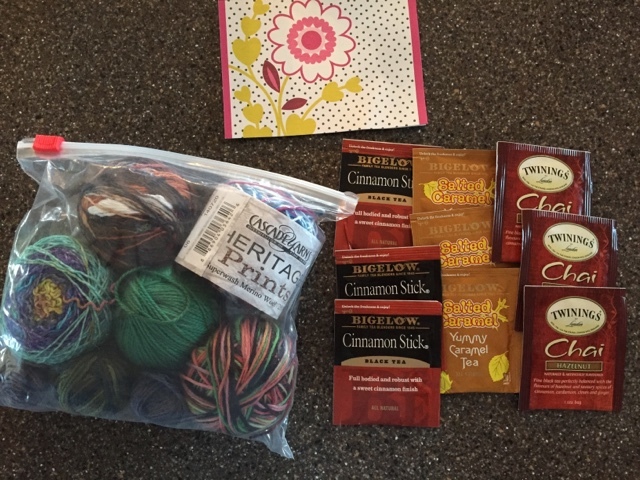 Nancy from Wyoming sent me this wonderful packet of sock yarn ends, perfect for the blanket and some tea too. I love tea as I'm not a coffee drinker. 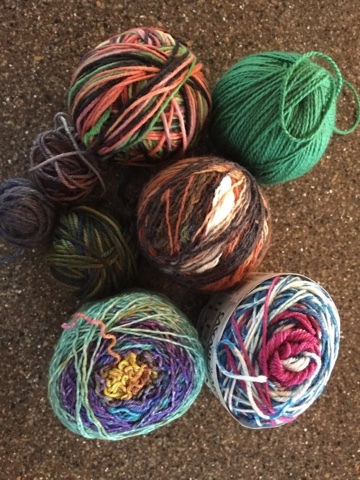 These little balls of yarn are so welcome and give some variety to the few colors I had from sock leftovers. Thank you again Nancy! Sherri in Las Vegas sent me five pair of mittens to add to the back for next year. 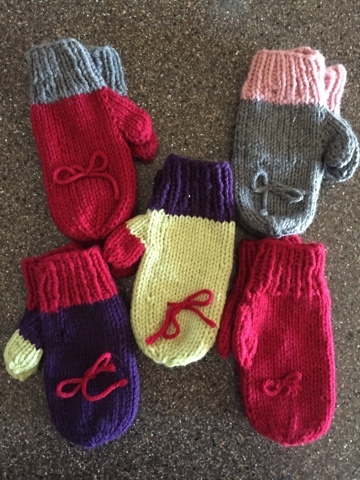 Even after being laid up from an accident, she thought of the children and made some mittens. How sweet was that? Thank you so much Sherri. We now have 12 pairs in total for next winter. A great start! And Kris. 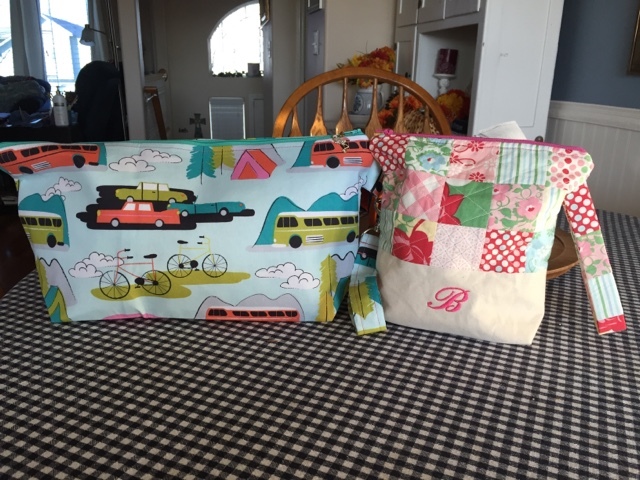 Oh my goodness, Kris sent me these amazing project bags! 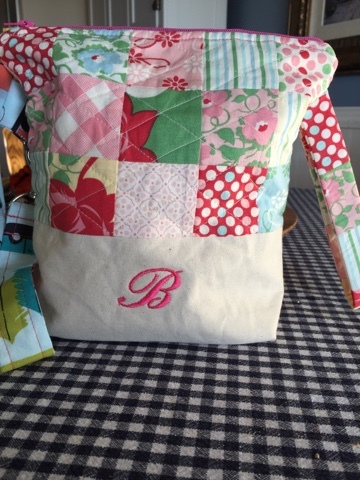 I mentioned to her that I had been trying to get a quilted pastel patchwork bag from an Etsy shop but by the time I found out she had listed bags, they were always sold out. That very day Kris made me that perfect bag on the right and even embroidered my initial on it. It's even better and more perfect colors than the ones I was trying to buy. 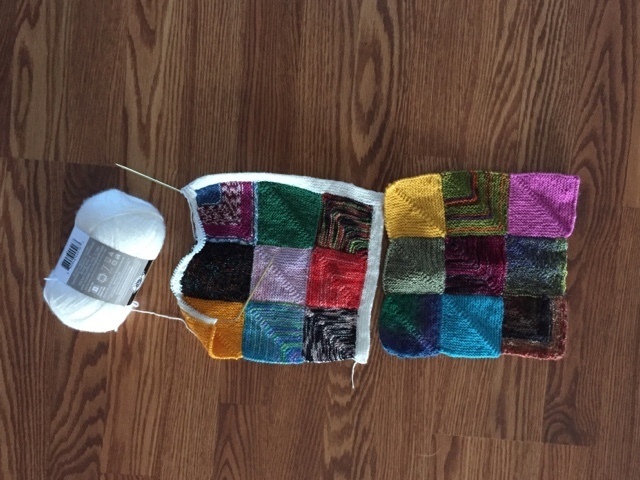 It's the perfect sock project bag. And then. 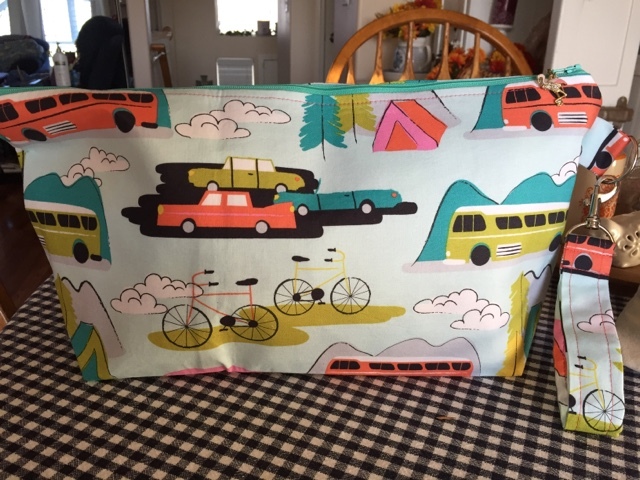 She made me a vintage camper shawl size bag! Just look at those campers. Kris and I share a love of camping and I can't believe she did this for me. I'm completely blown away by her generousity. 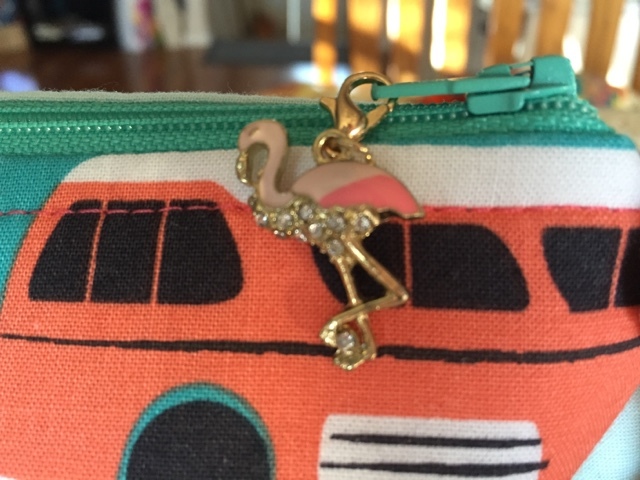 And the camper bag has a flamingo progress keeper/zipper pull! Is that perfect for this bag or what? I just cannot get over how sweet this was. On Friday, we gave Christmas gifts to Jamie and the kids since we won't see them at Christmastime. Caleb was thrilled as you can see by his smile. Kyleigh was pretty happy too. 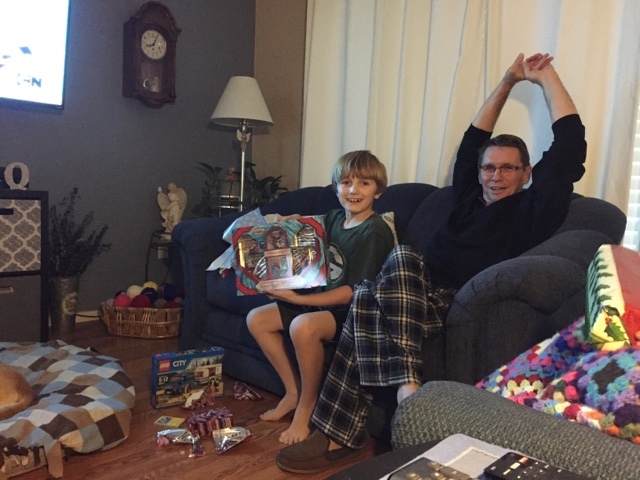 We were still in our jammies and they had a wonderful time playing with their gifts. Here they are all bundled up to go home. Gosh, it's hard to say goodbye knowing it will be months before we see them again. We have set up google chat though, so I'll be able to keep in touch with them on their kindles now. I mentioned we drove up to the lake on Saturday. 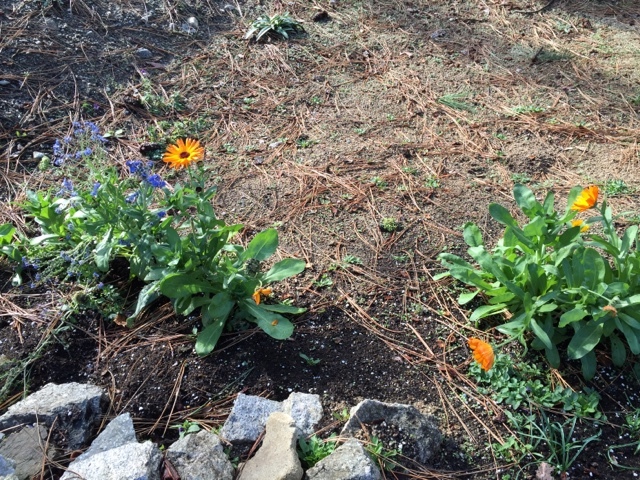 The wildflowers are still in bloom...or they were before last night when we received a few inches of snow here in Spokane. That means the lake probably got even more. Snow on the mountains but none in the valleys on Saturday. Well, I think I've made this post way too lon,g so I'll close. I hope you all had a wonderful Thanksgiving if you live in the U.S. and if not, your weekend was a lovely one. Hopefully I'll be back before too long. Oh, poor you. Under the weather or not..you still put me to shame. Those hats are fantastic as are the blanket projects. All that would have taken me years. I am happy to see that you've been spoiled by the residents of blogland. Feel better soon. I missed you! Such lovely and thoughtful projects. Loved seeing all the happy, smiling faces. Bless you sweet friend. I am glad you are feeling better. You were missed. :) Blessings always. Glad to see you post again! I'm glad you're feeling well enough to do it. Sounds like you had a nice time with family. We had a nice quiet Thanksgiving. I made s turkey breast and fixins just enough for us. I crocheted and watched football and other tv stuff. I didn't want it to be Monday and have to work, but it was. 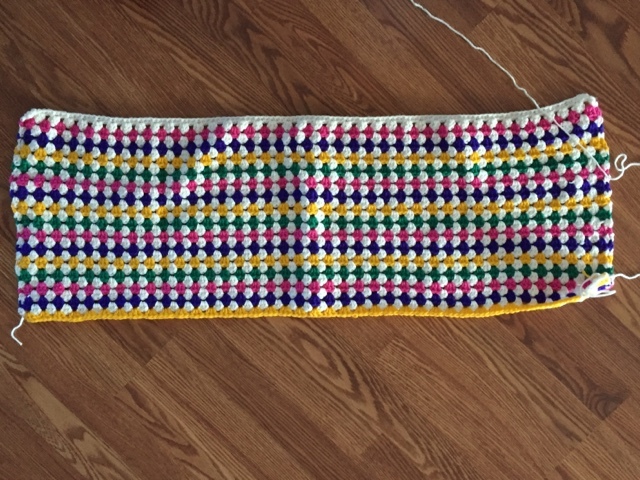 I should finish up the blanket border tonight. Only one long row to go. Hope you continue to improve and feel better! My dear Betsy, I am so, so sorry you have been having all of these issues. Bless your heart you have been through so much these past couple of years. I am so happy that you are finally headache free, I hear those headaches are the worst, and that is coming from someone who suffers from headaches. You are so productive even during your time of recuperation. I hope that you are taking it easy and resting as much as you can. 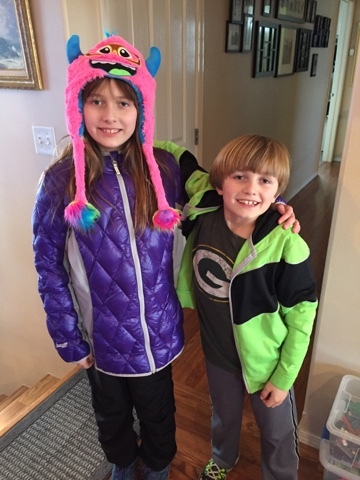 Love the photos of the grandkids, they look as happy as can be. And that sweet baby, she is gorgeous. Betsy I am sending you lots of love and healing thoughts. Blessings to you my sweet friend. By the way you deserve every special treat you receive. I had hoped you and Dennis were off on some fabulous adventure. . . sorry that you've had such a difficult time this month. Thrilled to hear that you're feeling better and that you're able to be upright. 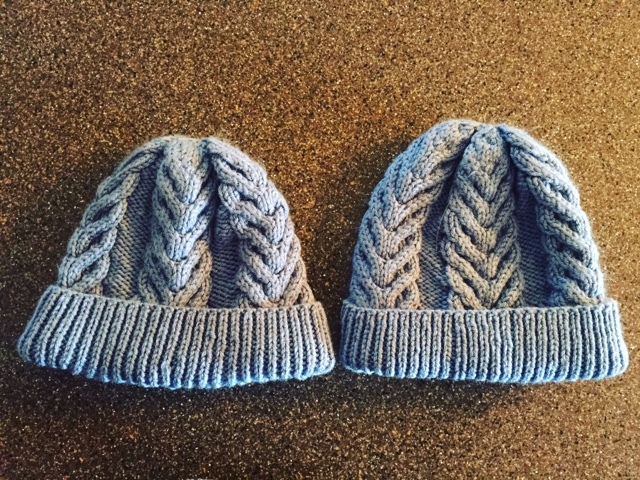 Love the hats you're knitting for the boys. Those that have little appreciate getting items made especially for them. Bless you for sponsoring another teen in addition to the original two boys. It's so good to hear from you. You poor dear! I'm so sorry you went through all that. Little Rachel is so precious! She looks like a little doll. You are very talented. I think I will get my crochet hooks out and do some crocheting. It was so nice to catch up with you, Betsy. I'm sorry you're having a hard time with your health. I understand how difficult it can be to have to lie around so much; I had lots of bedrest before and after both of my births, so I know what that aspect is like. The headache sounds awful. I remember a friend having that kind of headache when something went wrong with her epidural during labor. She said it was terrible. I enjoyed seeing all the wonderful things you've made for kids lately. You're so kind and generous. It was nice to see your grandchildren and the new baby girl too. My mother-in-law's name is Rachel so that's a lovely name to me. I hope you're feeling more like yourself soon, take care. Oh, Betsy! I am so happy to see a post by you. I am so very sorry that you have been suffering so much...that is so terrible to hear. May God just bless you and send every bit of healing you need. I am so glad God blessed you with such thoughtful gifts from kind friends. What a blessing! He is always faithful. Hello, Well all I can say is you have chosen joy in the midst of this affliction! Please take care of yourself and rest when you can! This to shall pass! Oh Betsy, I do feel for you, I've had a spinal headache the first time I nearly died had a few now, I had it for three days so feel for you for having it for three weeks!!! I was 16, and it was when they finally found out what was wrong with me, they drained all the fluid out of my spine and pumped it full of air to take an X-ray. My body went into shut down. And they had to inject me with cortisone to bring me back. ...... technically I should've gone long ago. God has other plans. I'm so glad you were able to see your grandees, and thrilled re your gifts from loving friends, God knows cares and gives us the desires of our hearts... isn't He wonderful!!??? How blessed we are! God bless you dear friend, rest in Him..
Hard how I know it, but it's a God chosen path dear sister. Bless your heart that sounds so painful! But I am glad you are healed now, and your knitting projects are so sweet. 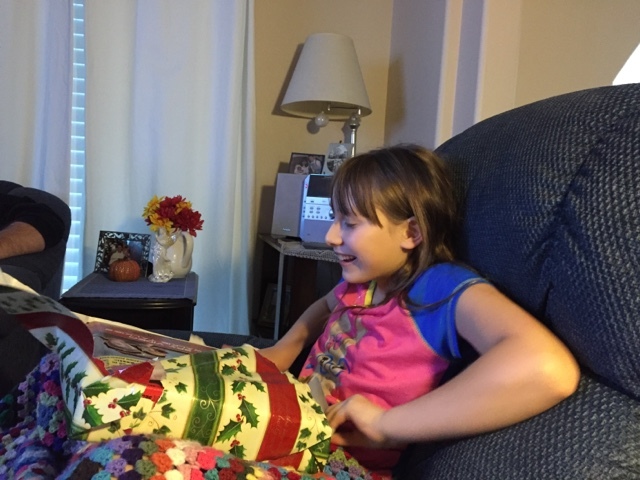 Your grands are sweet and I am glad you got to see them since they won't be coming on Christmas. Have a blessed day! Hope each day finds you feeling much better than the previous one! Love that gumdrop blanket! Is it crocheted or knitted? Hugs from Bellevue! So glad you had a great Thanksgiving with your family. I'm playing "catchup" with your posts.I always admire you for all your charity work and contributions to others. I love the fact that you got some "treasures" yourself! P.S. I am not in any way indicating that all diseases are caused by the person that gets ill....I hope I didn't come across like that....I just meant we have to do everything we can personally to stay healthy and not rely totally on physicians to cure us of our "ills". But they are definitely an important part of the team of healing....just make sure you have the right people on your "team".